these homes need only 15kWh/m2a. – The remaining heating and hot water demand can be covered almost completely by renewable energies. A Passive house provides a consistent, comfortable temperature in winter, as well as in summer without using a conventional heating or air conditioning system. 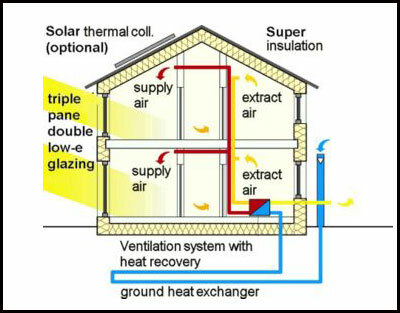 Using the existing temperature provided through solar irradiation through the windows as well as the heat from appliances and inhabitants is sufficient, the necessary heating energy for a passive house is only 10% of that needed for a conventional house. Due to the powerful insulation the heat stays inside the building, all surrounding surfaces are equally warm. For this reason there is no radiation asymmetry (heat radiation) originating from exterior walls in a passive house, and also the resulting draught phenomena are avoided. The reverse conclusion would be that the heat stays outside in the summer to avoid overheating. Internorm: Passive house certified 5 times over! 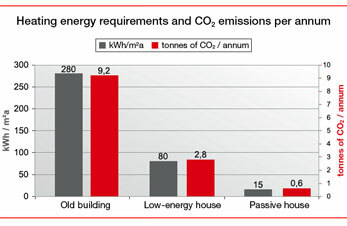 High quality components are a must for achieving the passive house building standard. An objective appraisal of one particular property – energy efficiency – is, however, not always possible. Consequently, the introduction of a norm for product comparison is both effective and meaningful. The independent Dr. Wolfgang Feist Passive House Institute of Darmstadt sets guidelines and carries out a standardised evaluation of products according to these requirements. Certificated products have the appellation, “passive house-appropriate components” and this indicates excellent quality in terms of energy-efficiency. The choice of certificated components eases the task of the planner and helps achieve the passive house building standard. For all your passive house windows and doors look no further than A Touch of Glass-Design and Build, the reason being we are partners with some of the passive house leading suppliers and innovators in the UK and Europe.